We all have beliefs about ourselves: about who we are; about what we can or can't accomplish in life; about what kind of person we could be or should be. From the day we are born until about age 7 we absorb everything around us because we are too young to have developed the critical part of our mind. Just watch a child and you'll see them, like sponges, taking everything in and learning all about themselves and their world. It is at this young age that we create the program for the rest of our lives. What we learn about the world and about ourselves as very young children forms the blueprint for the subconscious program that we build on throughout our life. These beliefs exist for a good reason, they helped us understand and survive at a time in our early life when we really needed it. We grow-up and change and that time ends, but the beliefs remain. Whether we want to or not, we repeat that outdated program from childhood- again, and again, and again as an adult. Some of these beliefs are positive and can support us and some of them are negative and can limit us. You are leaving 90% of your own natural resources out of the game. That's why self-sabotage, negative thinking and bad habits can feel so strong and insurmountable. Being in the hypnotic state relaxes your critical mind and allows you to uncover those hidden, auto-pilot programs. Once conscious of those outdated beliefs, you can transform them into powerful positive support that you choose and make it easy to achieve your goals and improve your life. In order to find new ways to express our legitimate needs and update these outdated programs, first we have to become aware of them. Negative and limiting beliefs like not being worthy, safe or loveable are often unexamined and become automatic. They are the unconscious filter through which we interpret life. 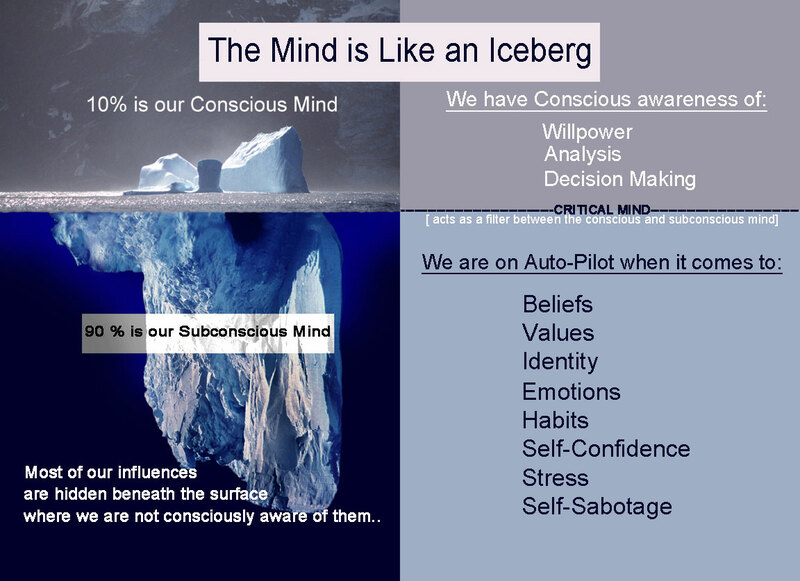 They exist just below the surface in your subconscious mind - but we can transform these beliefs with ...Hypnosis. The hypnotic state is the key that relaxes the critical part of the conscious mind, allowing us to shine a light on these unexamined outdated beliefs under the surface, within the subconscious. With this greater insight, it is possible to understand these limiting beliefs and discover the best way to change them into something new and supporting. Hypnosis is a safe and natural, yet​ altered state of mind that is very similar to daydreaming. Despite its power, there is nothing mystical or magical about hypnosis. In fact I'd be willing to bet that you have already experienced it. Has any of this ever happened to you? Have you ever been fully engrossed in something and totally lost track of time? Have you ever driven to work, and as you pull into the parking space, you realize that you don't remember the last 10 minutes of your trip? Have you ever gone to the movies and reacted emotionally to the story even though you know it is not real? If you answered 'yes'to any of these questions, you have experienced hypnosis. Hypnosis is a natural state and a powerful tool that's already there for you to use. No. Hypnosis coaching is not- nor is it a substitute for -psychotherapy, counseling, psyciatric care or medical treatment. If someone is seeking coaching for a medical/mental health issue I require that their medical/mental health provider approves of hypnosis coaching before service is provided. My coaching is provided only as a compliment to medical/mental health treatment. I make every effort to give my clients the very best experience and results, even if it requires a little bit of paperwork. You're worth it! Yes. Hypnosis is safe, natural and healthy with virtually no side effects. In fact, the effectiveness of hypnotherapy is backed by thousands of studies focusing on a wide range of issues from weight management to pain control. When you use hypnosis to solve an issue, you are using your whole mind and you are always in control. All hypnosis is self-hypnosis. I'll bet that you have already experienced hypnosis. Hypnosis requires focused attention, physical relaxation and imagination. If you're someone who tunes things out when you're concentrating on something you enjoy, then you are a natural. The determining factor is that you want to be hypnotized. Yes​​​​​. You will be aware of everything that is happening during the session. Not only will you be aware of and remember everything in the session but at the same time you'll be aware of your surroundings. Just like when you're at the movies and you choose to become involved in the film. You know that all the other people are there too, but you choose not to focus on them. No​​. Although to an observer it might look like you're asleep, hypnosis is a calm relaxed state that is not sleep. Many people even have a heightened awareness. It's like daydreaming with your eyes closed, but it is not sleep. It is possible that if you are not well rested, you might fall asleep during a session, but that rarely happens. No​​​. All hypnosis is self hypnosis and you are always in control. ​This seems like a silly question, but it's the one I get most often. Contrary to how it's portrayed in Hollywood and on stage you can not be made to do or say anything that you don't want to and you can not 'get stuck' in hypnosis. Ending the session is as easy as opening your eyes.